The great beauty of kids is that they can find magic in the most simple of activities 🙂 Gotta love ’em for that! 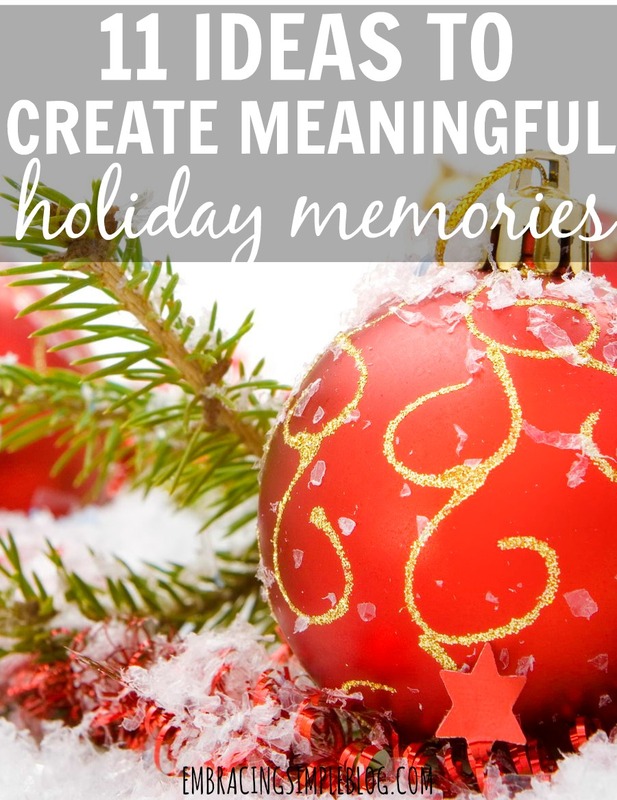 Today I’m sharing some simple ideas for your family to do together that will help to create meaningful holiday memories for all involved. I hope these spark some inspiration for you in these last few weeks of the holiday season and help you to make the most of this time you have with your family. Spend an afternoon crafting homemade ornaments to hang on your tree or other festive decorations to display around your house. This is a great way to commemorate your child’s crafting talents at whatever age they are at right now too. Think paper snowflakes, popcorn garland, or even just coloring pictures to hang in the hallway. 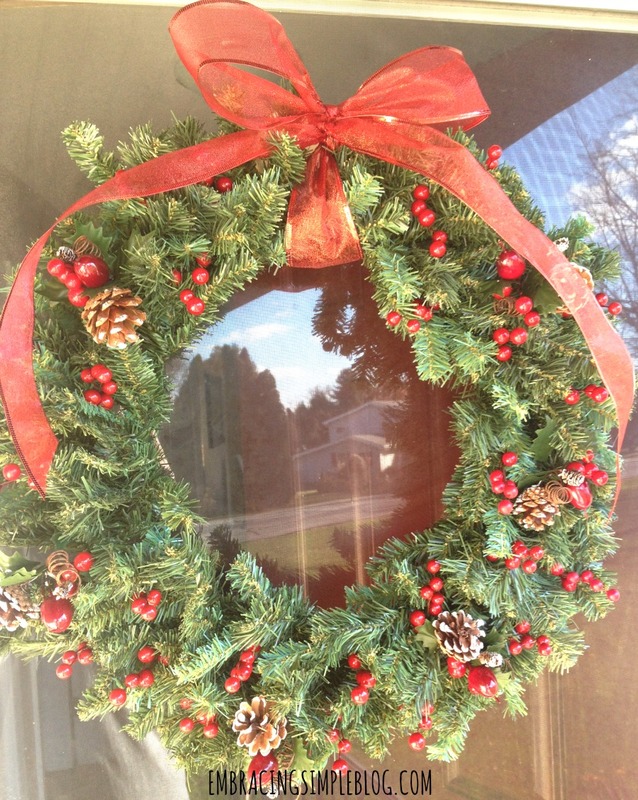 Or if Mom wants to get a little craftier, try out making your own wreath! I made my own Christmas wreath two years ago and hot glued fake cranberries, snow-covered pine cones, and some ribbon to a plain evergreen wreath. Considering I have zero crafting abilities, I was pretty happy with how it turned out! If you have older kids, they might even be able to help you with a wreath craft like this. Make some homemade treats like cookies or festive popcorn and deliver them to all of your neighbors! I made my own festive popcorn to deliver to our neighbors last year and it was a big hit. I simply laid some freshly popped popcorn out on some parchment paper, drizzled some melted white chocolate over it, and then sprinkled it with some red and green chocolate pieces and sprinkles. I gave it away in mason jars to help keep it fresh; kids and adults alike loved it! Bust out your ice skates for the day and head out to your local pond for some ice skating fun. Or if it’s not cold enough where you live, go to an indoor ice skating rink! If your kids are old enough, this can be a great activity that the whole family can enjoy together and is a nice way to get some exercise in too. There are so many unique and fun ways to use advent calendars to countdown to Christmas. While many people I know use candy or chocolates to put in their advent calendars, I love the idea of reading a new Christmas book as a family every night together as a fun way to countdown to Christmas. Print out some of the lyrics to your favorite holiday songs and head out to homes of friends and family to spread some Christmas cheer (I recommend maybe calling beforehand just to make sure they are actually home). Take full advantage of having your Christmas tree up and spend a night camping out on the floor next to it! 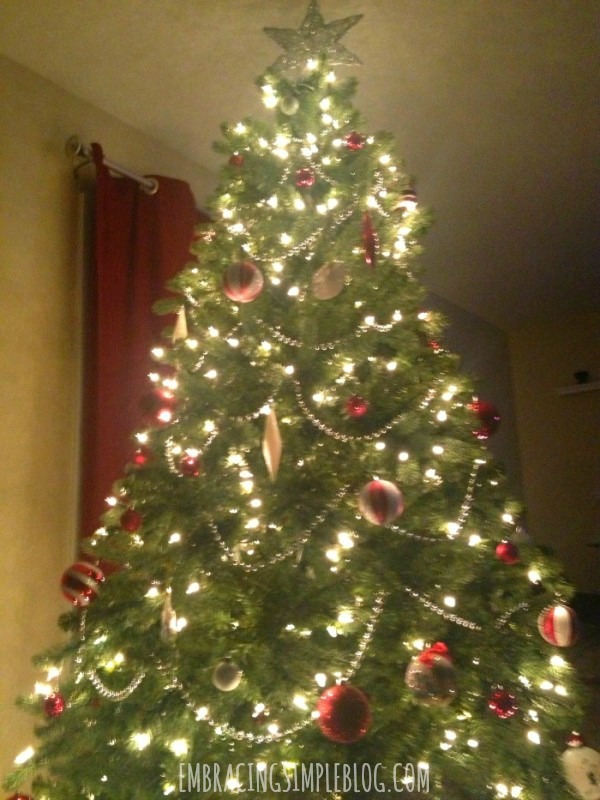 Pop some popcorn, bring out some books or games, and just have a great night spending quality time together basking in the beauty of your tree. Pick up some brown paper bags and battery-powered tea light candles, and let your kids put together their own luminaria to light up your front walkway or even place around your home. It’s such a simple and easy decoration to put together, but is so magical to see once it’s all assembled! While this may not be as easy to coordinate as the other ideas I’ve included in this list, this is truly something your kids will never forget. See if any of the local towns near you are hosting a holiday event, as some of them bring in a sleigh complete with “reindeer” or horses to give out rides for a small fee. It’s a once in a lifetime activity that the whole family is sure to enjoy! Taking your kids on a shopping trip to purchase toys for children who are less fortunate is a great way to show them that the true spirit of the holiday season is in giving to others. Make an afternoon of going to the local toy store and letting your kids pick out toys to gift to other children through an organization like Toys for Tots! There’s something so magical about having dinner by candlelight, no matter how old you are. I remember my Mom doing this a lot when we were growing up and I plan to do this with my own kids too. Having dinner by candlelight really allows everyone to relax and I’ve found encourages more conversation. If you have toddlers or small children that you’re afraid might touch candles left in the open – try putting them inside of a lantern so that it doesn’t pose a safety hazard for their little hands. I have so many fond memories of making delicious goodies in the kitchen with my family growing up! There’s something about everyone working together to create something delicious to enjoy that really feels so festive. 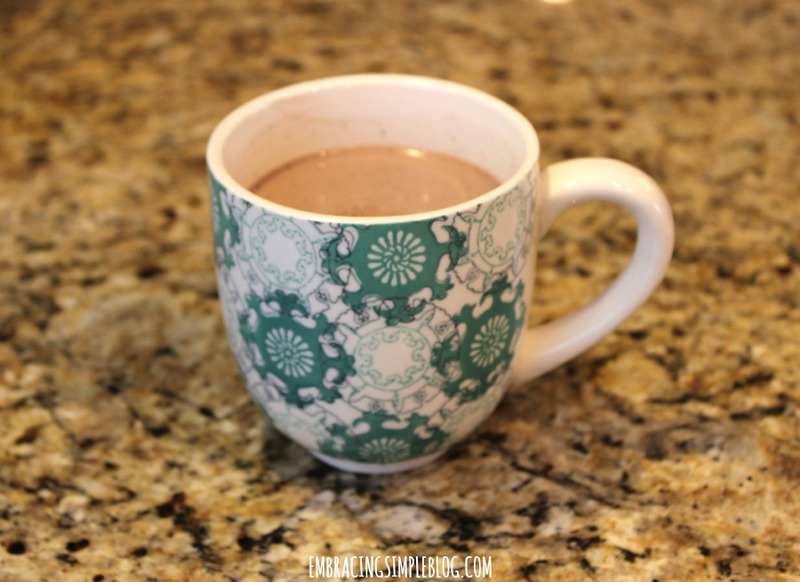 You don’t even have to spend a ton of time in the kitchen making cookies from scratch to have the same effect, even making something as simple as hot cocoa to enjoy together can be fun! 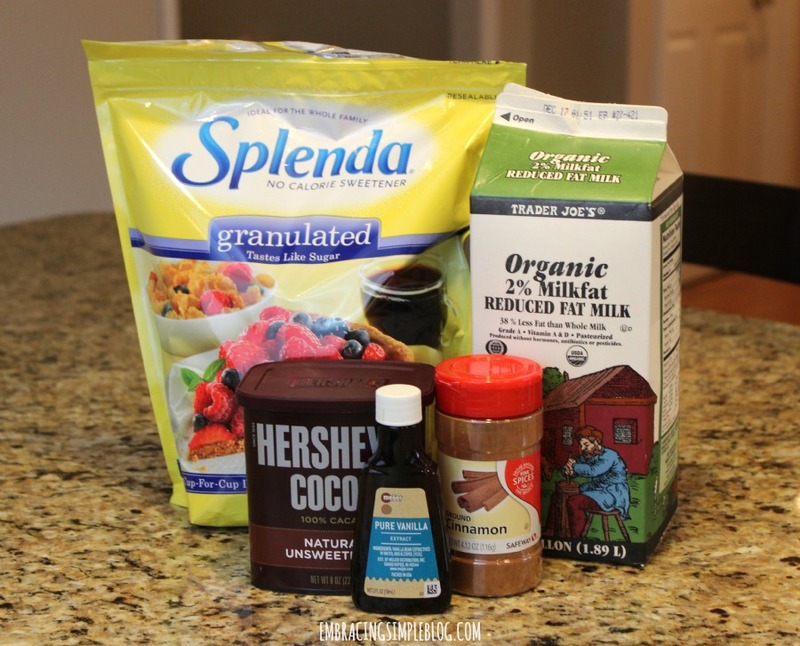 SPLENDA® Sweetener Products can be used almost anywhere sugar is used, so I typically just add the same amount I would as if it were sugar. And usually just a little splash of vanilla and a dash of cinnamon goes a long way though, so don’t go too crazy with those additions. If you like a more festive-looking hot cocoa, it would also be fun to add some whipped cream topping with some red and green sprinkles for decoration if you have guests over! As a brand dedicated to adding sweetness to life, SPLENDA® inspires consumers to make smarter, balanced decisions with SWEET SWAPS™. Find recipes, tips, tricks and more at SweetSwaps.com. If you’re looking for more ways to create meaningful memories and savor the holiday season, be sure to check out my Savor the Holidays course! It’s a 21 day mini course that will help you slow down and soak up all the joy this holiday season has to offer, and makes a great gift for friends or family too 🙂 I would love to have you join us! Click here to learn more. I love the idea of making luminaries! We are doing that for our neighborhood Christmas party. The whole neighborhood puts them out front in a line so the streets are all lit up. It’s gorgeous!! And the kids get sleigh rides with Santa during that!! I love the idea of hanging out with the Christmas tree, haha! Play a holiday movie, have some hot cocoa, and just soak in the beauty of the season. Thank you Sarah!! Omg the kids got sleigh rides yesterday?! That is awesome, I’m sure they loved it! We started a tradition of wrapping up holiday books and opening one a night to read together as a family. We bought most used, so not a huge expense, and its a fun way to count down to Christmas, and spend time together each evening. Plus – we just rewrap the books year after year, subbing out one or two as the kids outgrow them. I love that Mrs. SSC, seriously such simple yet really fun tradition! When we put the tree up, I point out all the decorations that my children have made. Other than that, we don’t come back to the tree until Christmas day so I like the idea of spending some time by the tree. I also like the idea of baking something together.